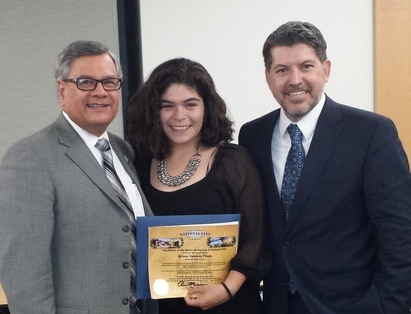 Photo above: (left to right) Alejandra Mier y Teran, executive director, Otay Mesa Chamber of Commerce, with Ruben Garcia, SBA district director, San Diego. 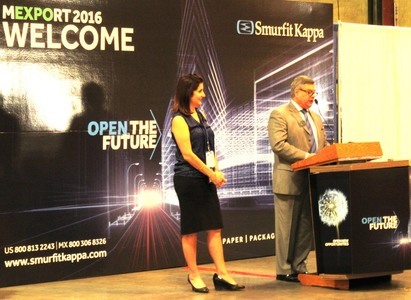 Ruben provided opening remarks at MEXPORT 2016's inauguration. San Diego Contracting Opportunities Center; and Ruben Garcia, SBA district director, San Diego. 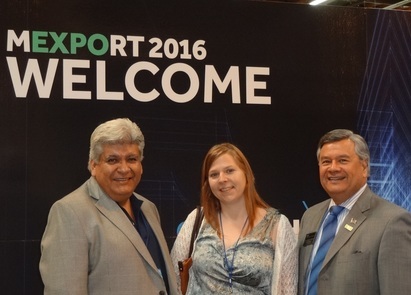 Photo above: Cynthia Harris, SBA district international trade officer, San Diego, worked an exhibit booth at MEXPORT 2016. Thank you Victor Castillo for sharing the CITD's exhibit booth with SBA. 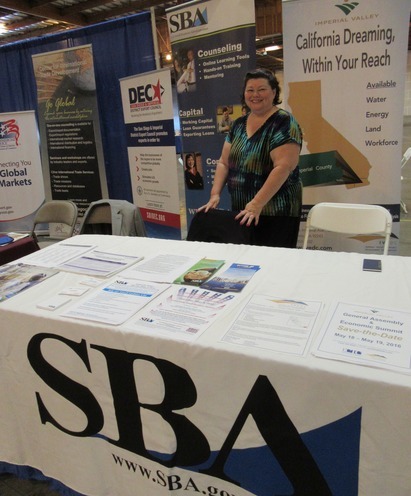 Photo above: Merica Lim, SBA business opportunities specialist, San Diego (right) assists attendee, at the SBA exhibit table, at the Women's Mega Mixer. 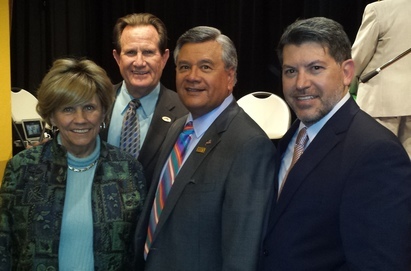 Photo above: (left to right) Maria Hughes, SBA lead lender relations specialist, San Diego; National City Mayor Ron Morrison; Ruben Garcia, SBA district director, San Diego; and Miguel Vasquez, CEO/chair, California Foundation Fund at the FutureBoss Inauguration. FutureBoss is a unique program that targets high school seniors and juniors who are identified through an application process as promising young entrepreneurs. The program and its curriculum, created by the California Foundation Fund, are taught by university faculty and mentors at Alliant International University. Photo above: FutureBoss Inauguration participants. Photo above: FutureBoss graduation participants. 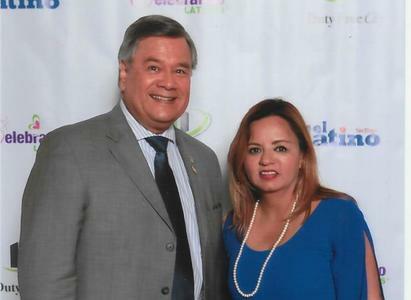 Photo above: (left to right) Ruben Garcia, SBA district director, San Diego and Fanny Miller, publisher/editor-in-chief, El Latino San Diego at the El Latino San Diego Client Appreciation Mixer and Celebrando Latinas 2016 Kick-off event. Dean Dickau assumed the Procurement Center Representative (PCR) position for San Diego on May 2nd. Dean was the deputy of small business programs at the Space and Naval Warfare (SPAWAR) Systems Center (SSC) Pacific located at Point Loma in San Diego, CA. He held that position for over four years. Prior to this, Dean was a contracting officer at SSC Pacific. And prior to that, Dean spent several years with various federal procurement centers as a contract specialist. Early on in Dean’s career, he owned and operated his own landscaping business. Dean is a graduate of San Diego State University, where he earned a Bachelor of Arts (BA) degree in Economics and a Master of Science (MS) in Business Administration. Most recently, Dean earned a Masters of Business Administration, specialized in Management, from National University. Kathleen Moran transferred to the Small Business Administration (SBA), from the Library of Congress, in the fall of 1985. She served a total of 37 years as a civilian federal employee, 31 of which have been with the SBA’s San Diego District Office. Until late 2006 she held the position of Information Receptionist, at that time, she was promoted to the position of Program Support Assistant. Kathleen was an enthusiastic greeter for the office, and she always had a smile and a friendly word for visitors, both in person and by telephone. In addition to her SBA duties, she brightened the office lobby by bring flowers from her mother’s garden each week. 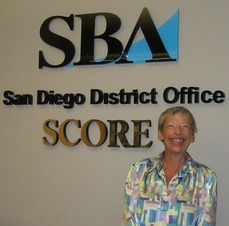 She was definitely an asset to the San Diego District Office and SBA. The third export workshop, in the series, will be held on June 9th at Pt. Loma Nazarene University's Mission Valley Campus and will focus on finding foreign buyers and may also include some documentation guidance. Followed by an Export Logistics and Transportation workshop to be held on August 18th at the same location. The cost for each workshop is $15. Contact the San Diego CITD at 619-482-6393 or support@sandiegocitd.org for more information on these upcoming workshops. Click on the titles linked below to read each press release. Next series to start June 8th. E-flyer coming soon!